The custom scene is awash with concepts and Photoshop renders and imagined bikes. But designer Davide Caforio, who flits between Milan and Rome, has turned an inspired idea into reality. 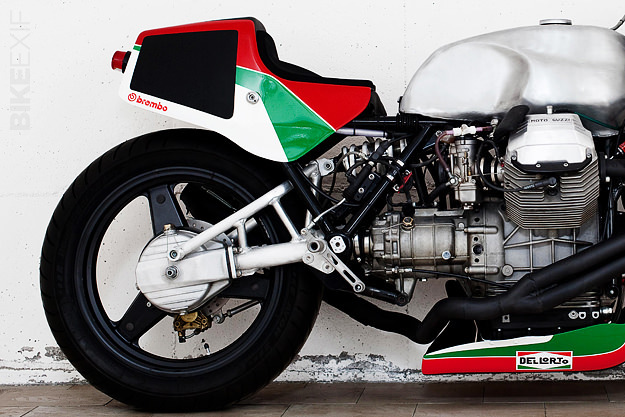 Caforio is an accomplished Moto Guzzi builder, and well known within his native Italy. 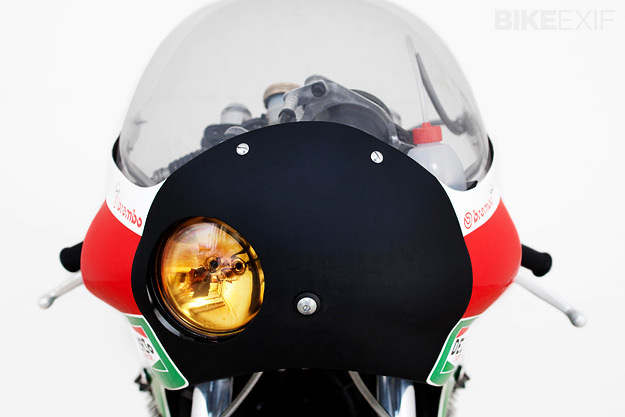 He’s now created a tribute to the endurance machines that fought at the Suzuka 8 Hours in the 80s, racing through the night with headlights blazing. 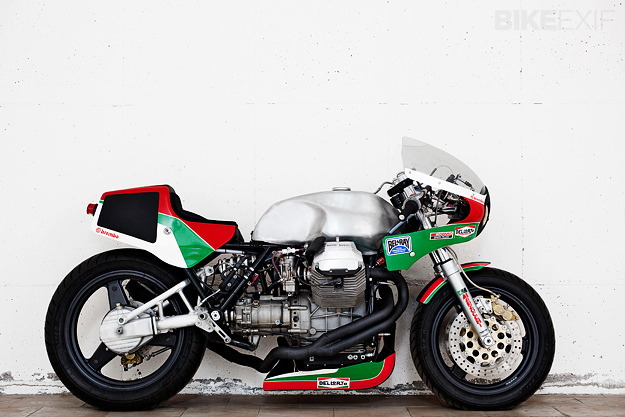 Caforio describes his Le Mans Mk IV as having a “false history.” It’s a motorcycle from a parallel universe, one that pitched the Mandello Del Lario factory against the Suzukis of Wes Cooley and Graeme Crosby, or Wayne Gardner’s Honda. It’s not a cosmetic job. The engine is heavily modified, bored out to 1150 cc with twin spark heads, big valves and uprated cams. Everything is balanced and the flywheel has been lightened to sharpen response. Fuelling comes from Dell’Orto-PHM carburetors. The frame has been modified and lightened, and the aluminum swingarm is hooked up to a race-spec WP monoshock. Up front are a set of new Marzocchi 41.7mm forks, with steering aided by a Bitubo damper. The wheels are race-spec too, 18” at the back and 16” at the front, shod with Avon tires. The brakes are Brembo Serie Oro. 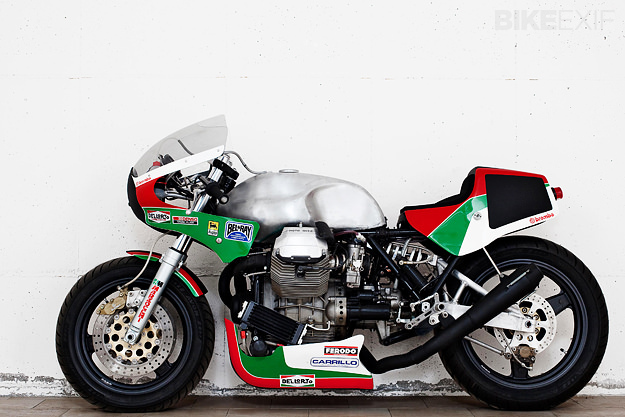 Caforio has nailed the look of the typical 1980s endurance racer with his custom fiberglass bodywork, which is loosely modeled on the Yamaha TZ750 two-stroke. 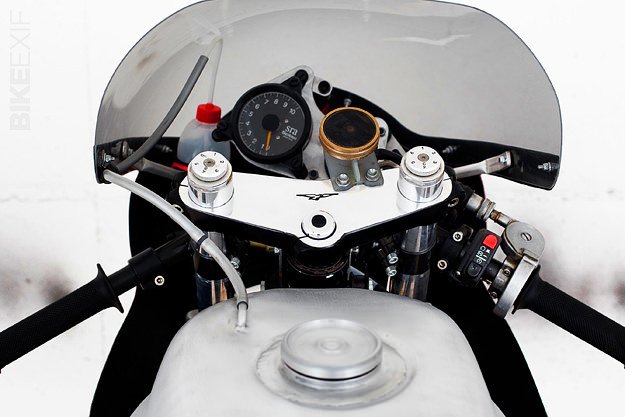 The aluminum tank houses a vintage Bimota filler cap and the rearsets are replicas of classic Bimota items. The paint is unapologetically patriotic, using the colors of the Italian flag, with a sprinkling of decals for authenticity. 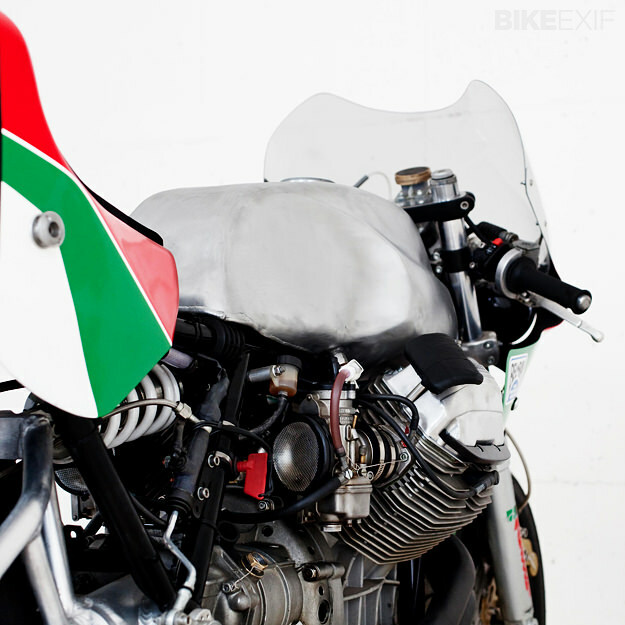 Head over to Davide Caforio’s website Ruote Fiere for more Moto Guzzi goodness.